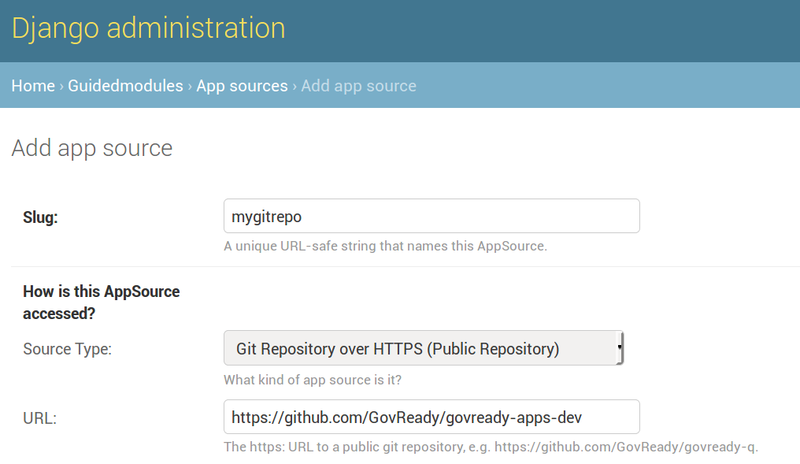 GovReady-Q can be configured by an administrator to load compliance apps from one or more sources, which can be local directories or remote git repositories. When using the Hosted Version of GovReady-Q, GovReady PBC is the administrator. 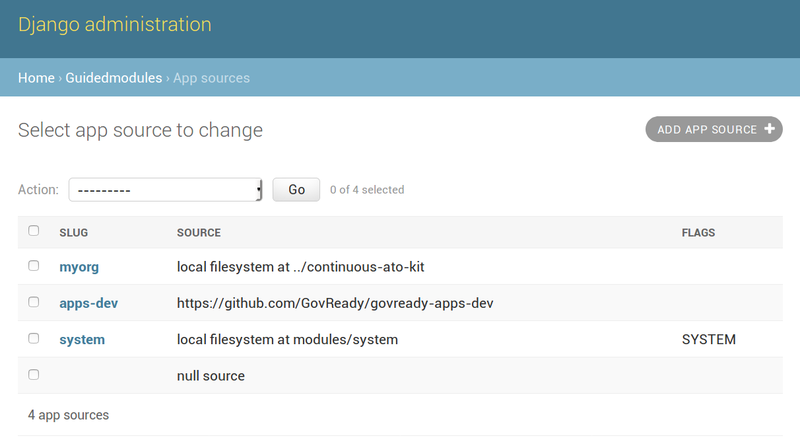 If you are the administrator of an installation of GovReady-Q at your organization, the information below will help you configure the App Sources available to your users. Each App Source points GovReady-Q to a directory or repository of compliance apps. The first App Source field is the Slug. The Slug is a short name you assign to the App Source to distinguish it from other App Sources. The Slug is used to form URLs in GovReady-Q’s compliance apps catalog, so it may only contain letters, numbers, dashes, underscores, and other URL path-safe characters. There are four types of App Sources: local directories, remote git repositories using HTTP which are typically public repositories, remote git repositories using SSH which typically use SSH deploy keys for access, and remote GitHub repositories using a GitHub username and password for access. then your Path would be /home/user/compliance_apps. The path can be absolute or relative to the path in which GovReady-Q is installed. The Git Repository over HTTPS source type is for git repositories, such as on GitHub or GitLab, that can be cloned using an HTTPS URL. These repositories are typically public, or in an enterprise environment public within your organization’s network. The other fields can be left blank. then set the Path field to apps. If the compliance apps are not in the repository’s default branch (i.e. something other than the typical master default branch), then set the Branch field to the name of the branch to read the compliance apps from. Since this requires user credentials, it should be avoided for production deployments in favor of using Git Repository over SSH (see below). 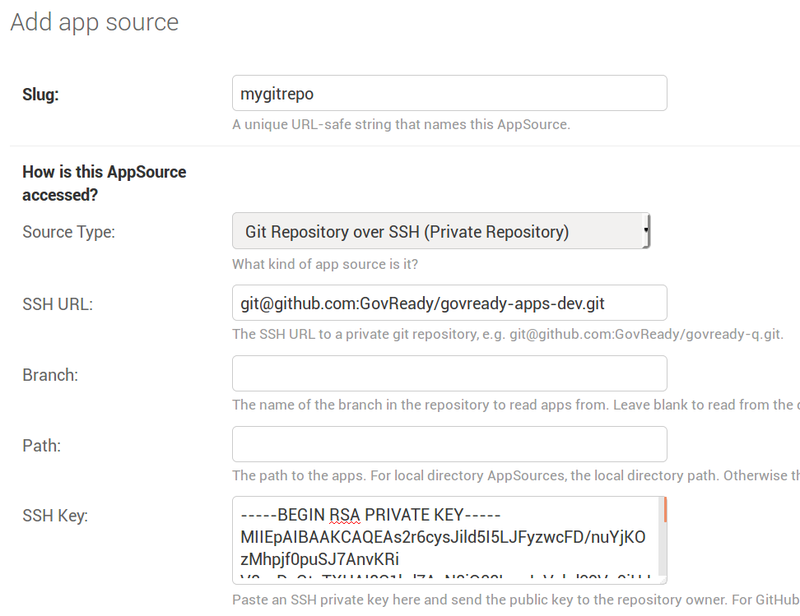 If your git repository is private and accessible using an SSH URL (which typically looks like git@github.com:organization/repository.git) and an SSH public/private keypair, such as with GitHub or GitLab deploy keys, then use the Git Repository over SSH source type. 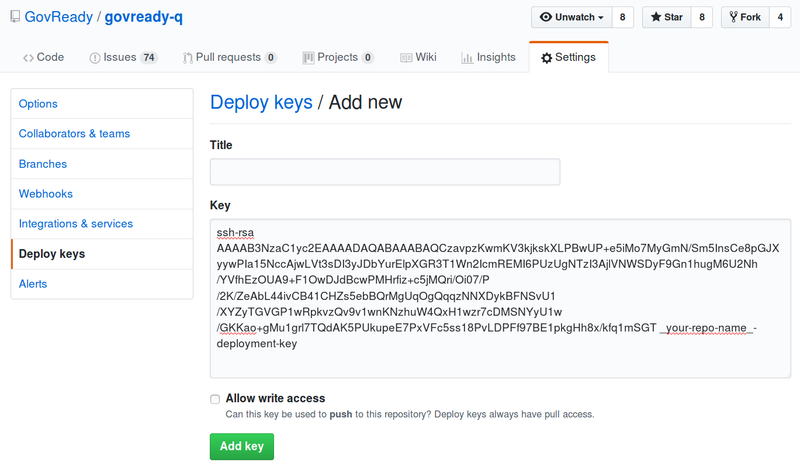 Your GovReady-Q instance will hold the private key half of the newly generated keypair, and your source code control system will hold the public key. The other fields can be left blank. Path and Branch can be set the same as with the Git Repository over HTTPS source type (see above). Make the key read only by leaving “Allow write access” field unchecked and click Add the key to save the key. This source type can be used to access private GitHub repositories using a GitHub username and password or a username and personal access token. The other fields can be left blank. Branch can be set the same as with the Git Repository over HTTPS source type (see above). Since this source type requires user credentials, it should be avoided for production deployments in favor of using Git Repository over SSH. Controlling which organizations in a Q deployment can access which apps is done via the App Sources table. The “Available to all” field of App Source, which is on by default, gives all users of all organizations the ability to start an app provided by the App Source. If the “Available to all” field is unchecked, then only users within white-listed organizations can start apps provided by the App Source. The white-list is a multi-select box on the App Source page. Removing access to a App Source does not affect any apps that have already been started by a user. To enable these scripts, the Trust assets flag must be true on the App Source that provides the app. This flag must only be true if any Apps provided by the App Source, including Apps already loaded into Q, are trusted to have executable content that may have as much client or server-side access as the Q instance does itself.